Recently celebrating his 40th year, Jim Arnold has been the City Attorney since January 25, 1977. He is a 1972 graduate of the University of Florida Law School and the Citadel Military College of South Carolina. He is a founding member of the Clay County Bar Association. 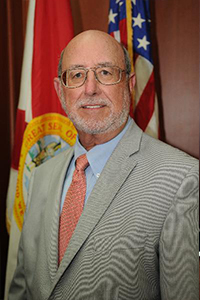 He has been a member of the Florida Bar Association since 1973. He established the Law Offices of L. J. Arnold, III in 1973 earning a solid reputation for providing the highest quality legal services in a broad range of substantive areas. His pragmatism and common sense as well as his dedication to client satisfaction distinguish Mr. Arnold from others in the legal community. Mr. Arnold has over three decades of experience in the areas of Family Law, Personal Injury, Real Estate, Business, Estates, Government Law, and Civil Trails. Martindale-Hubbell Law Directory, the most respected national attorney directory, has rated Mr. Arnold "BV", an indication of an exemplary reputation and well-established practice with very high ethical standards.